In cinema, there is often a reliance on intricate plot developments, with intrigue aroused by whodunits and convoluted thrillers dependent on a gimmick or MacGuffin that keeps interest at peak level for whatever implausible event follows. It’s rare, therefore, to find a film that loosens up a little, spreads its wings and welcomes a little style into the mix. Enter Ben Wheatley, British auteur, and director responsible for the action thrill ride, Free Fire. If different is what you’re after, look no further. Working off of a loose foundation – a gun deal, gone awry – Wheatley has designed and executed a film set entirely within and around a single warehouse, this warehouse being home to what could well be the most ambitious action scene in the last five years: a huge gunfight, that effectively covers two-thirds of the film’s runtime. Now, I can already tell what you’re wondering: is ‘a gun deal, gone awry’ and a gunfight really the entire plot? The answer is pretty simple: yes. You’ll find little narrative baggage here. Wheatley has stuck strictly to his guns, if you’ll pardon the pun, by concocting an action film that is exactly that, focusing on the action and the levels of chaos that one can reach in its staging. 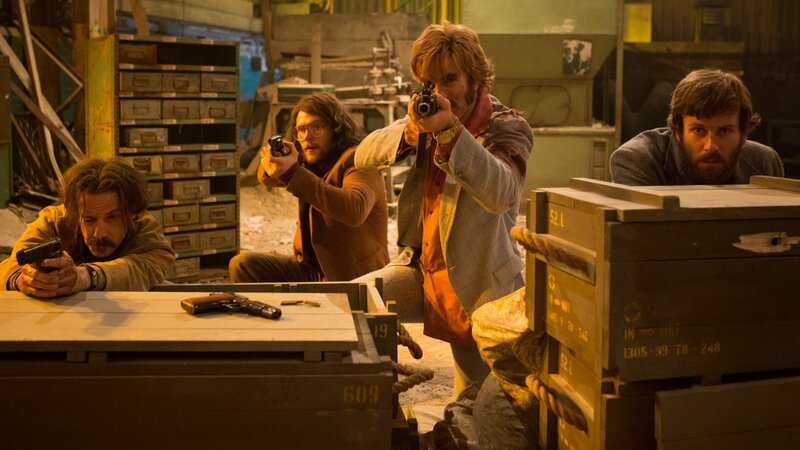 If this doesn’t sound like your cup of tea, then you may not like Free Fire. There’s no massive twist here, no Hitchcockian double take. Characters do not get their time to shine with heightened dramatic beats. Instead, it is the situation they find themselves in, and their actions and reactions to this situation that are most telling and effective in building a commitment to them. In spite of this, Free Fire still finds time for some crackling dialogue, with taunts and catchphrases flying across no man’s land. The efficiency of said characterisation all comes down to Wheatley’s original script, and Wheatley is firing on full automatic, as the quips come quick, the line delivery slick. There’s never a dull moment, and the actors give it their all, selling their motivations and providing all the incentive you need to watch their spontaneous conflict come to its inevitable conclusion. The acting is also commendable, and while the overall cast is successful, it is Sharlto Copley and Armie Hammer that walk away with the film. Hammer’s Ord has a calm, undeterred composure that provides a number of standout moments during the action scenes, characterising him as somewhat of an indomitable professional in this ludicrous business. More significantly, Copley’s peculiar, well-dressed yet intermittently hostile Vernon gets the most laughs. Flourishing with his brash South African accent, his delivery and timing is superb, and his rather futile flirtation with Brie Larson’s Justine really adds the icing to the cake: his phrase ‘watch and Vern’ better catch on. As well as the engaging performances, Wheatley imbues the film with a real wit and style that amplify its quality. Set in the late 70’s, the costumes and sporadic music beats are indicative of a bygone era, one that fizzled with often hilarious fashion choices (with the benefit of hindsight) and catchy tunes. With Vernon’s light blue suit and Ord’s questionable turtle neck jumper, you’ll feel the time and the setting, adding that extra aesthetic coating that takes this film even further from any gritty reality: this film is meant to show flair, and it achieves that with flying colours. Also, kudos for the use of Creedence Clearwater Revival’s Run Through The Jungle, the type of music that always adds that extra layer of cool to any film. However, for a film focused entirely on the action, there are issues. While the script pumps out comic one-liners and absurd action moments one after the other, it can at times feel like Wheatley has forgotten about a select few of his roster of characters, rapidly switching between the multiple faces. This unpredictable editing can at times leave one feeling a little disorientated and unsure of why we are following this person or that individual, when they’ve so little to insert into proceedings. Additionally, the lack of a musical score during the preliminary fight is a little alienating. While there is the occasional melodic cue, as mentioned, these come primarily towards the latter half of the movie. For a film so confident in its style, it seems a little surprising that Wheatley didn’t opt for a musical score or soundtrack to ramp up the action a little more. There is a distinct reduction in dialogue exchange within this earlier instance. While this is a logical decision, in terms of how a gunfight would play out, the lack of a non-diegetic solution, in order to infer how we are supposed to feel about the events ensuing, leaves us feeling a little unsure of ourselves in relation to the narrative exploits. Nevertheless, Wheatley’s film is nothing but ambitious. Working in and around a single setting, Wheatley has crafted a complex labyrinth of action junctures that supplement the subtle storytelling here: by the very nature of the life-or-death scenario, anyone can see why these characters act as they do. In this day and age, of films conditioned by the prerequisites of a high budget and an expansive world-building narrative, its fresh to see a film so contained, yet so stylish and idiosyncratic. It certainly isn’t perfect, and can leave one feeling a little unsure at places as to the general spatial awareness of the characters’ surroundings and the emotional significance of certain narrative altercations. And yet, for the pure adrenaline rush one gets from the effervescent direction, sharp script and emboldened performances, it’s hard not to get a kick out of the less than friendly trading of bullets.